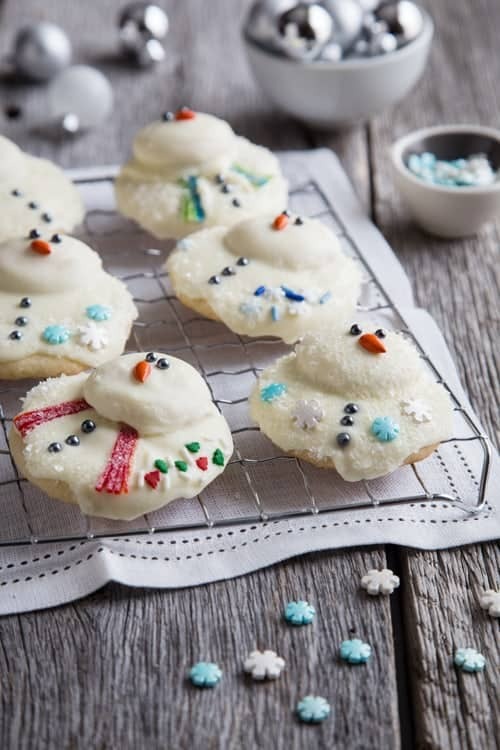 Melting Snowman Cookies are as adorable as they are scrumptious. Kids and grown-ups alike will delight at seeing these on your holiday cookie tray. I mentioned the other day that we’re going the homemade route for a lot of our gifts this year. Cookies, cookies and more cookies, is what I’m thinking. Starting with Peppermint Sugar Cookie Bark and Cranberry Cookies in a Jar and continuing with these ridiculously adorable Melting Snowman Cookies. I mean, seriously. Who could resist these stinkin’ cuties?! Not only are they adorable, they’re double decker. Using Betty Crocker™ sugar cookie mix rolled into two different sized dough balls, they’re baked up three-dimensionally and covered in almond bark and sprinkles. They look elaborate. They’re not. Not even remotely. What I’m saying is, if I can do them with an almost-11 month old crawling and cooing and wanting Mama to play with her, you can do them too. 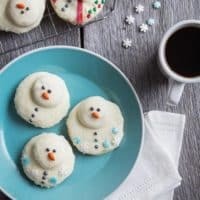 I’ve said before I’m an equal opportunity baker – from my doctored up cake mix recipe to these Melting Snowman Cookies using Betty Crocker’s sugar cookie mix pouches, I give you full permission to give yourself a break this crazy holiday season. We can do amazing things, you guys. We just have to give ourselves enough grace and the tools to get our end results. And when the end results are as cute as this, it’s pretty easy to agree that sometimes, a pouch of cookie mix is the way to go. You can customize your melting snowmen with any color of sprinkles, or even use sour candy strips to create cute scarves. I’ve said before that I love all the gorgeous decorated cookies that show up this time of year, but I simply don’t have the time, patience or skill to flood royal icing into things. I love love love that these Melting Snowman Cookies provide the same look and feel, with a fraction of the effort. If you’re planning a cookie party (which is a great idea, FYI), you must check out the Betty Crocker Kids’ Christmas Cookie Corner section of their website. So many great ideas to whip up with the littles in your life. Sounds like a wonderful winter afternoon to me! Are you ready to #GetYourBettyOn with me? We’ve got this. It’s time to be a holiday superstar! Place two black sugar pearls or confetti pieces on small cookie for eyes, and an orange candy coated sunflower seed or sprinkle in center for a carrot nose. Place three sugar pearls or black confetti sprinkles as “buttons” on the bottom cookie. Alternatively, you can decorate one large cookie in the same manner, to represent a completely melted snowman. If desired, use cookie icing to draw on arms. Sprinkle with snowflakes or other festive sprinkles; allow to dry completely. If you can’t find black sugar pearls or confetti sprinkles, use mini chocolate chips turned upside down for snowman eyes and buttons. If you don’t have a microwave, the candy coating can be melted in a saucepan over low heat on the stovetop. 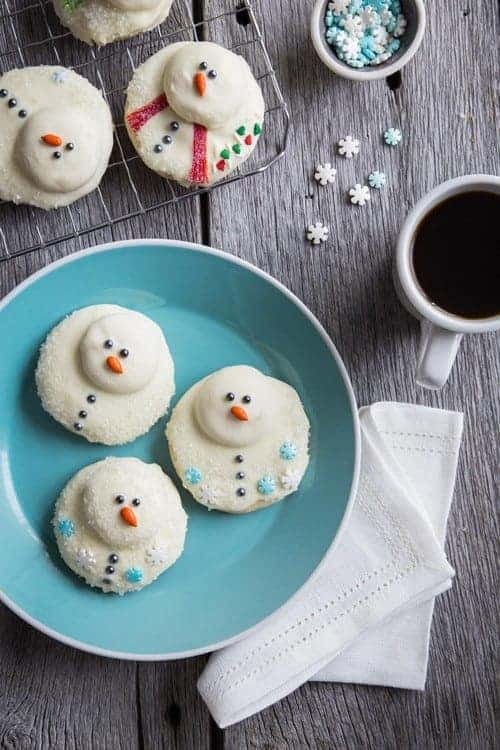 For varied degrees of melted snowmen, decorate single large cookies for a completely melted snowman appearance, or stack them two or three cookies high for a less melted appearance.